If the original plan in the Great Western Railway Act of 1835 had gone ahead, a branch line terminus would have been built at Kingston Farm, at Kingston Mills. 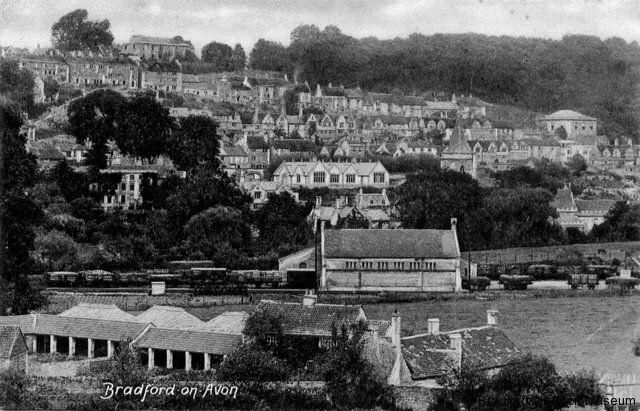 Bradford on Avon station and its goods shed were built by the Wilts, Somerset & Weymouth Railway Co. (WSWR) in 1848, in anticipation of opening its branch line to join the Great Western Railway (GWR) main line at Bathampton. However, it was not until 1857, after the GWR had taken over the WSWR in 1850, that the line was completed and the buildings fulfilled their purpose. 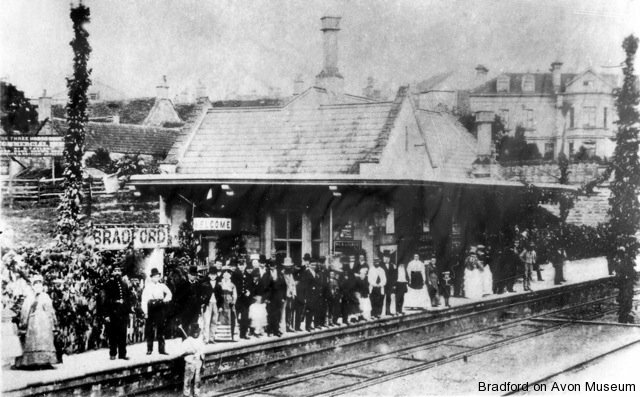 When it finally opened on 2nd February 1857, the station was called Bradford, but it and the town became called Bradford-on-Avon (the railway used hyphens and still does) in 1899 to distinguish it from various other Bradfords in the railway timetables. The town would also have adopted “railway time” (same as Greenwich) to unify timetables -real natural time in Bradford is about 10 minutes behind Greenwich. The platforms were lengthened to accommodate longer trains, especially after the track was converted from seven-foot broad gauge to standard gauge in 1874. When first opened there was only a single track, doubled later. 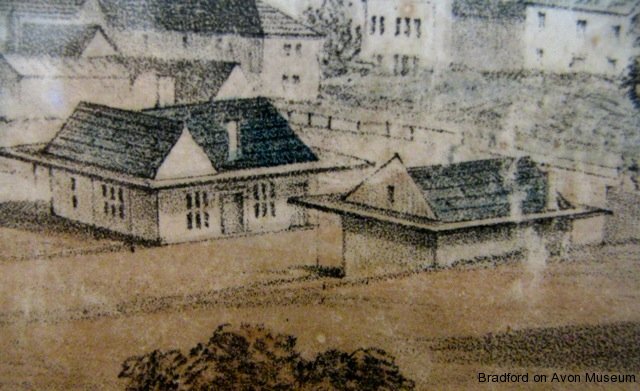 The buildings feature in many books on railway architecture, largely because so many others that came out of Brunel’s GWR drawing office have been demolished or have been greatly altered. 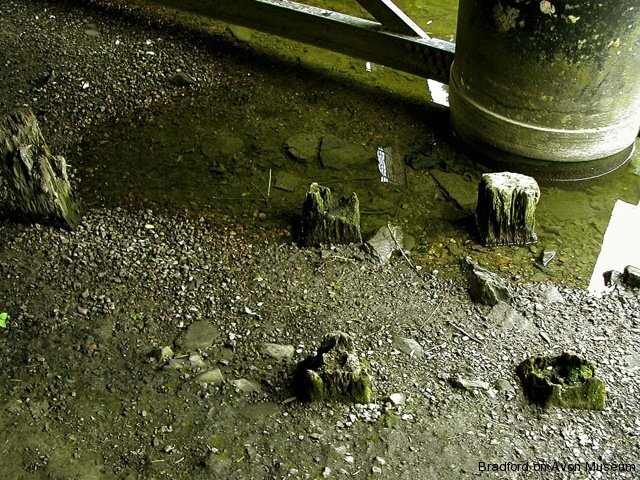 Some conservation work has been carried out to restore its features, bearing in mind that it is part of a modern working railway. It retains several old GWR bench seats and the signs are in GWR style. This heritage has been reinforced by repainting in Great Western Railway station colours. The present steel footbridge was provided in 1899; its roof was removed in the 1960s, but there are plans to provide a new one. The goods yard was on the Salisbury-direction (up) side and was equipped with a large stone-built shed, cranes for loading stone and sidings for unloading the coal that was coming from the pits of the Somerset coalfield. The yard closed to coal traffic in 1964, but continued in use for another year and the shed was demolished, apart from the wall along the side of the up platform. The yard is now occupied by a car park and the Bradford Health Centre. 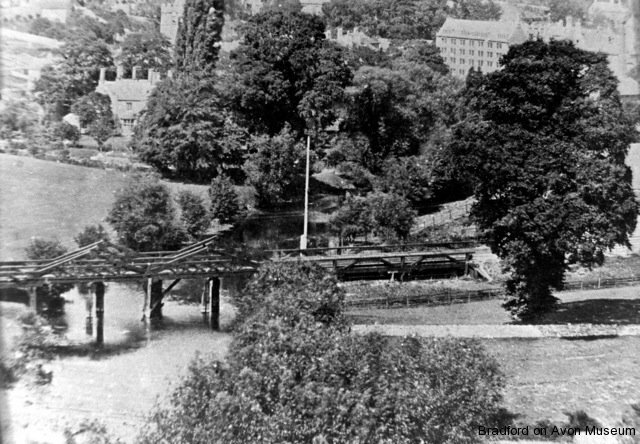 A signal box was situated near the bridge over the River Avon on the down side (towards Bath) and there was a small ground frame that controlled the level-crossing in Bridge Street, but these were also demolished in 1966. The signal box was only operated during the day and not on Sundays. On the same side of the track as the signal box were allotments that were cultivated by railway workers. 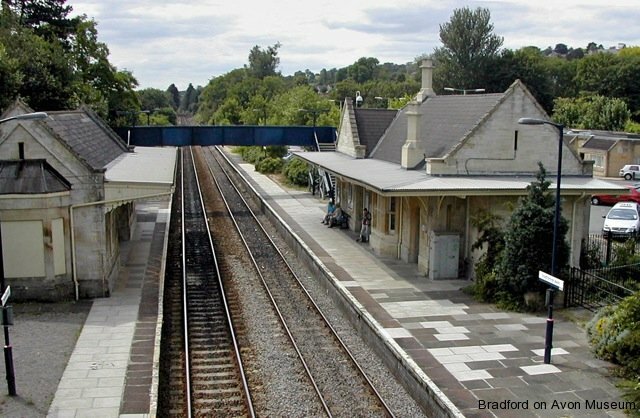 In the 1990s there came a short-sighted proposition to make the line single track, meaning that there could only be one train at a time between Bradford Junction and Bathampton Junction. Fortunately, this did not come about and now there are numerous workings of passenger and freight traffic daily. In the year 2015-2016 the station was used by passengers 524,180 times. Direct trains connect Bradford with Bath, Bristol, Cardiff, Gloucester, Worcester and Great Malvern to the west; Trowbridge, Salisbury, Weymouth, Southampton, Portsmouth and Brighton to the south and London Waterloo, Reading and London Paddington to the east. The platforms are to be extended to accommodate longer trains. Most trains are operated by the modern rail franchise-holders Great Western Railway (formerly First Great Western, no relation to the old GWR) and South Western Railway (previously South West Trains and, similarly, no relation to the former London & South Western Railway). The line is frequently used for diverted main line and CrossCountry trains, especially at weekends and occasional steam excursions pass through. A service of direct trains to London Waterloo was initiated by the Wales & West train franchise to coincide with the opening of the Eurostar terminal at Waterloo in 1995. 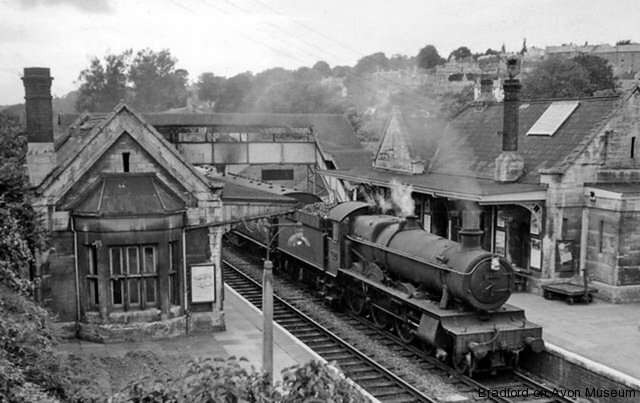 This gave Bradford on Avon a connection to Paris and Brussels with only one change of platform, but only one train per day in each direction. With the end of the franchise in October 2001, the service was continued by Wales & Borders, with one train originating from Carmarthen. The train ran through Westbury and Salisbury without stopping, going on to Basingstoke, Woking and Clapham Junction. After the end of Wales & Borders in December 2003, the succeeding Arriva Trains Wales did not continue direct trains from Wales to Waterloo. 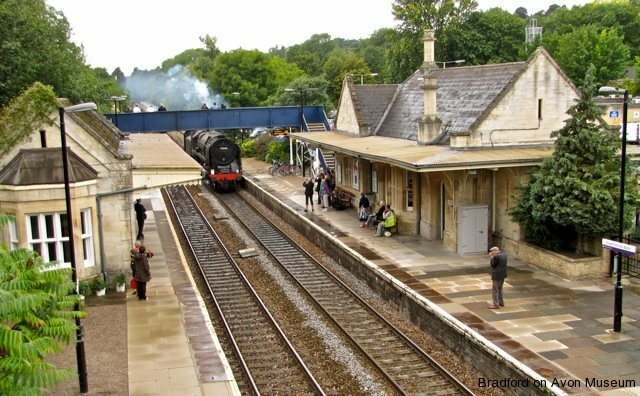 South West Trains began a service from Bristol via Bradford on Avon to Waterloo with three services daily, but several more stops, since August 2017 operated by South Western Railway. 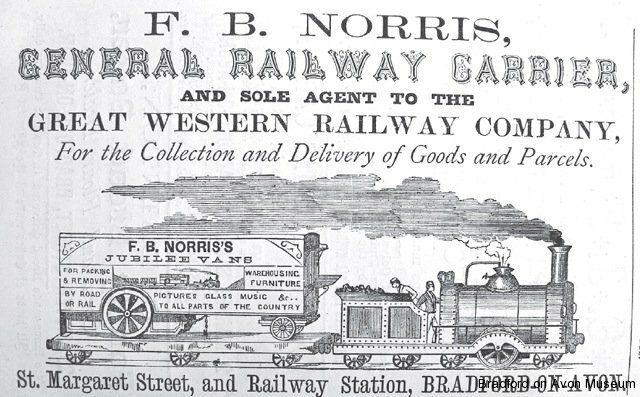 An advertisement from one of the 19th century businesses that used the railway station. Coal haulage firms distributed fuel to businesses and domestic premises.